It’s not just temperatures that are dropping in Glenwood Springs, Colorado. Iron Mountain Hot Springs admission prices are dipping in October as well. Cooler weather has its perks in Glenwood Springs, Colo. With the calendar well into the school year and the mercury regularly dropping into the single digits, Iron Mountain Hot Springs is preparing for “non-peak” season—that wonderful time of year from late Oct. through late May when the geothermal hot springs lowers weekday admission prices. The chilly weather generally translates to fewer guest visits at this time of year. If you’re the kind of person who likes to soak in relative solitude, this is what you’ve been waiting for—enjoy all 16 soaking pools and the family pool with fewer people in attendance. For maximum serenity, we recommend soaking during the weekdays and on weekend mornings. Despite some frightfully low readings on the thermometer, even the coldest days at Colorado’s newest hot spring are exceptional. For one thing, freezing and snowy conditions make it possible to stay immersed in the healing hot springs water for longer periods of time. But even the most frigid Glenwood Springs weather days are often tempered with Colorado’s famous sunny, blue skies. In fact, Colorado is touted to have a record number of gorgeous days per year, more than most states in the U.S. At Iron Mountain Hot Springs it’s possible to bask in the sunshine wearing only a swimsuit when other people are scraping ice off their windshields and layering on yet another wooly sweater for warmth. Non-peak season runs from Oct. 29, 2018 to May 23, 2019. During this time weekday admission prices to Iron Mountain Hot Springs drop to $20 for adults and $14 for children. Weekend and holiday pricing is $25 for adults and $17 for children. Holidays include: Thanksgiving from Nov. 16 to Nov. 25, Christmas break from Dec. 21 to Jan 6, and Spring Break 2019 from March 15 to 31. For locals and regular visitors, now is also an optimal time to purchase a seasonal or annual pass. Just like having a ski pass to your favorite resort—you can come and go throughout the day at Iron Mountain Hot Springs, stay as long or as little as you like. Seasonal passes run $275 per person, with the summer season blacked out from Memorial Day through Labor Day. Annual passes are $375 per person with no blackout dates. Both are valid for one year from the date of purchase. There are also options for adding a partner and dependents up to 26 years of age. 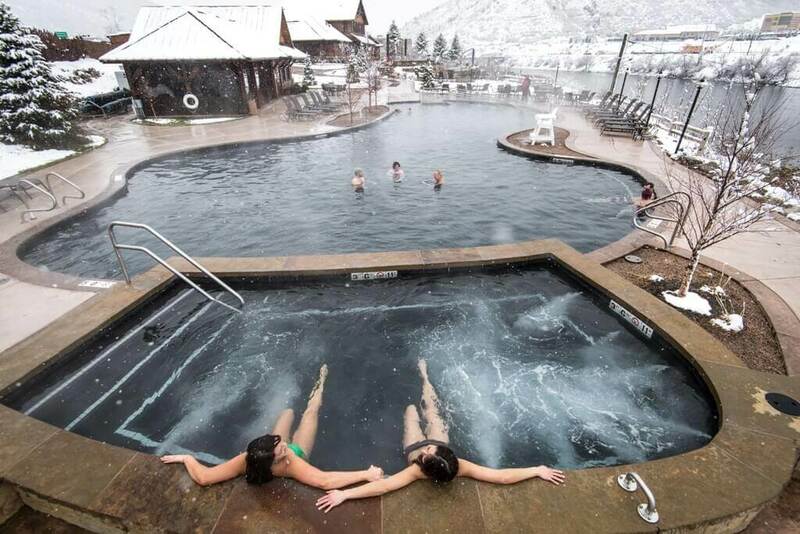 This winter stay warm, soak in serenity and save money at Iron Mountain Hot Springs in Glenwood Springs, Colorado.